You’re finally gonna hear from Mike today, so be on the look out for that. Before we get down to the business of getting down, I’ve got a brand new article I was involved with over at 411mania. It’s a Top 5 movies list, and this week we talk about our favorite drug movies. The parameters we were given were illegal drug movies, so I couldn’t include Limitless, which would have definitely made the cut. Today we’ve got some Push Day action going on, and your boy hit another PR, which, by my math makes me the strongest man alive. Sounds good to me. I learned myself a nice lesson today. 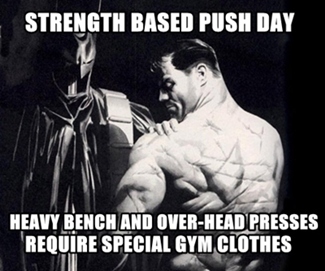 Last week I killed it on the Strength Based Push Day, setting two new PRs, but today I just wasn’t there on the bench. I think the reason being was that instead of my usual 8-12 hours of sleep, I only got 5. Also, I didn’t have a Muscle Milk shake before bed, which is loaded with all types of protein, some carbs, fats, and fiber. I think it loads up my muscles while I sleep. On top of that, I only had 20g of carbs before the workout instead of 40g. So, I really went into the workout under prepared, and saw how much it effected me. Glad you guys have been digging the videos. If there’s anything you’d like me to cover in them, lemme know and I’ll be sure to. Before we get down to the business of getting down, I’ve got a brand new video from the Fat Buff INC youtube page for you guys. I finally have access to a decent computer and editing program, so making videos is no longer a hassle, and will actually have a bit of quality to them. Today’s video is me rocking some 100lb dumbbells for Flat Bench, then there’s some Incline Bench, Rack Pull Deadlifts, and Dips. I also rock the voice over narration. New Fat Buff INC Video. First up I have a new article over at 411mania, Top 5 Fighting Movies. So many bloody movies to choose from, I hardly knew where to begin. There is one major omission, and that’s Warrior. I love that movie and am completely kicking myself for forgetting it. Anyway, hope you cats dig it. One move that I’ve talked about before, but will talk about again for the new readers, is the Sissy Squat. It has a ridiculous name, but it was named after a Greek guy who was made to constantly push a boulder up hill, only for it to keep rolling back down. So, everyday he’d push this heavy thing with his back against it, and using his legs. Well, a few centuries of that and his legs, especially his quads, got some size. I first read about these a few years ago, and decided to give them a shot. I only did 4 sets of 8, but my quads were so damn sore for the next 3-4 days that I couldn’t believe it. The guy who wrote the article where I first read about these said when he started doing them, his legs gained an inch in a months time. So, here’s what you do. Find a place where you can stand on something with your heels elevated. 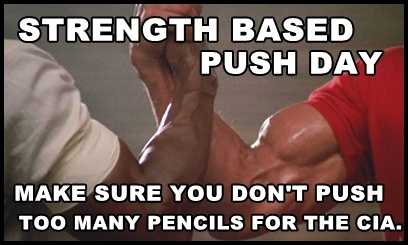 Also, depending on your strength and flexibility, you should have something to hold on to with one hand. Now that you’re in position, you simply act like you’re gonna sit in a chair, then right before you feel like you’re gonna fall backwards, you go back up. If that explanation is confusing, have a looksee on youtube. I much prefer these to Leg Extensions, as it really works the entirety of the legs, but with a fantastic emphasis on the quads. You get a great stretch in the quads, which really activates things, and a damn fine pump to boot. How can you lose? Got another article coming today, so keep them eye-balls peeled. Until then, check out the latest Top 5 I did with my boys from 411mania. Top 5 Judd Apatow Productions.